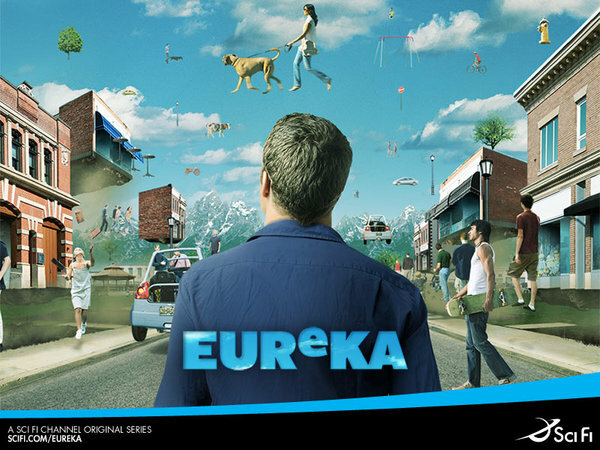 This week at SpockSoc, we’re showing Eureka season four. It’s been rather a long wait. For those not in the know, Eureka is a town created by Albert Einstein and the US government, and administrated by a corporation named Global Dynamics. In it, the government has gathered all the greatest minds in the country. Of course, since the town is composed almost entirely of geniuses, when things go wrong, they REALLY go wrong. Enter Jack Carter, formerly a US Federal Marshall, now town sheriff. He’s a complete average joe, and since he’s the only one in town who’s not an absolute genius, he’s therefore usually the only one who can think of a solution to the current problem at hand. Or at least, the only one who can say something so stupid that it gives everyone else the clue to solving it. In any case, it’s a great series. Everyone should certainly try to come, even if they haven’t seen Eureka before – it’s a new season, and all of last season’s storylines got wrapped up last season. This screening will even include the Eureka side of the crossover with Warehouse 13. Starting at 5pm in Red Centre G001. Pizza run at 7-ish. Also, remember: AGM next week. All Exec positions are up for re-election, even the presidency. We’re especially in need of a new treasurer, as Erin, our prior one, started a new job this session which runs on Friday nights. If you are thinking of running for office, don’t worry that we’ll be tossing you into the deep end – we’ll still be around to help ease you into things. Remember we need at least fifteen people there, even if it’s just for the AGM. I’m aiming to start the AGM at 7:30, and have dinner at the same time, so even if you can’t come for the whole night, try to be there then. Drop me a line if you want me to put you down for pizza.